Hey Yall! I hope you all had a fun and safe New Years! My family and I spent 4 1/2 days in Myrtle Beach to ring in the New Year. We have a tradition each New Years Eve to celebrate the New Year in Orlando Florida, but things changed this time because we didn't want to spend our time cramped up in crowds at an amusement park. We started this tradition back in 2012 by going to DisneyWorld, 2013 at Universal Studios, and 2014 at SeaWorld. After attending the amusement park, New Years Day we visit the beach to gaze at the ocean while reflecting back on years past. Each year we think about how much we've had grown, our achievements, and giving thanks to God for all our blessings. Since now I'm no longer working at an outside job, I can now take a longer vacation trip. 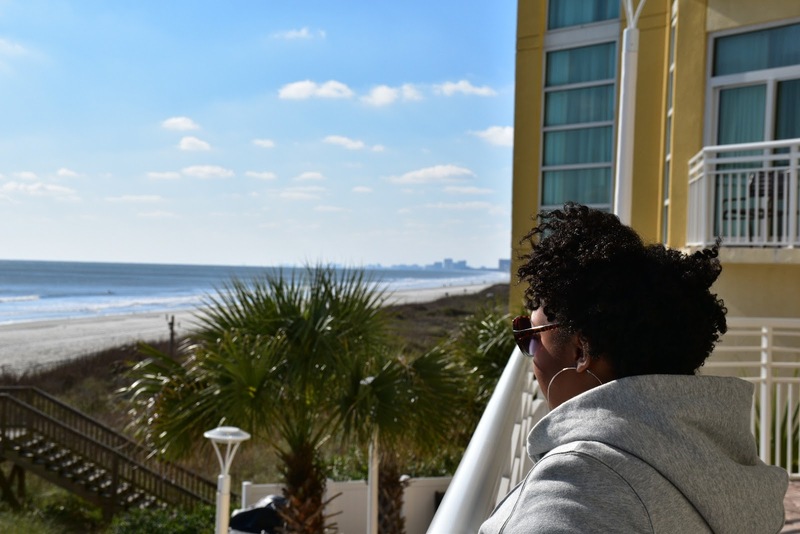 This trip to Myrtle Beach was the most extended trip we ever taken, and it was a much-needed relaxation trip. I have been so overwhelmed with emotions of becoming a full-time entrepreneur, I've been scared of the unknown future ahead. So many thoughts rolls through my mind I get terrified at times. Something about the beach puts me in a calming mood, and my anxiety goes away. I can simmer down, watch the waves crash to shore, and sink my feet into the sand. Very peaceful! As you all know, Myrtle Beach is my favorite beach due to all the family attractions. But this trip I was a bit disappointed because Myrtle Beach shuts down a lot of places during the winter season. 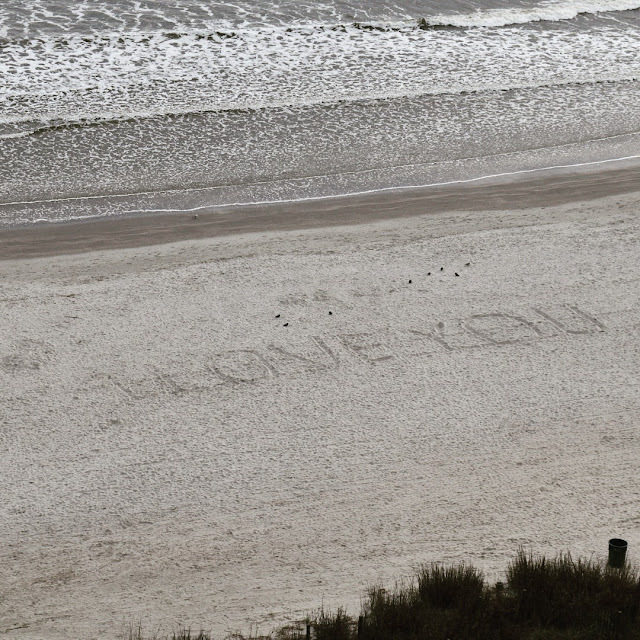 Winter is slow there, and not a lot of people visit Myrtle Beach because it's freezing. It was cold when we got there, however, the week before they were experiencing unseasonal warm weather. I was hoping that the warmth would continue while we were there but each day it got colder and colder. Since we were staying at Myrtle Beach for about a week, I wanted to find a resort that offers bedrooms. I didn't want to stay at a hotel with a studio room with two queen beds like we usually get; we would feel like we are on top of each other. As always, I went on Priceline searching for hotels with suites. I made out great this time because I found a timeshare owner renting out a two bedroom two bathroom condo at Wyndham right on Ocean Boulevard for $139 a night, plus no resort fees. I have never found timeshares on Priceline, or maybe I just didn't notice since I'm always doing Express deals with them. I drove 5 1/2 hours to Myrtle Beach New Years Eve night while Mr. M and the girls slept. I woke them up when the clock striked 12 am to yell out HAPPY NEW YEAR and after that, they quickly went back to sleep. Driving this far was scary for me since I don't drive long distance trips. Road were wet due to the rain, and I was hydroplaning while driving. That had me nervous as heck! Mr. M was too tired to take the wheel since he worked all day. Gratefully we made it safely to our destination. We checked in at the registration desk, and we were on our way to the 9th floor to our condo. Immediately we opened our door, and we were amazed by how spacious our condo was! The decor was beach themed, great views of the other Wyndham buildings outside, along with the view of the ocean, full kitchen stocked with utensils and cookware, dining area, living area, master bedroom with a jacuzzi tub, two full bathrooms, and guest room with two beds. This place is a home away from home! It's bigger than my last apartment! There is something I didn't care for about this Wyndham, and that was their parking, it's horrible if they have a lot of guests. There are four 15 stories condos towers and all garages were full for several days due to Wyndham being at capacity. I didn't think Myrtle Beach would have that many people due to it being the slow season, but I guess I was wrong. Wyndham has an overflow parking area across the street, and the shuttle picks you up if you don't want to walk. Also, there is another thing I didn't like about Wyndham; I'll get to that in a minute. That 5 1/2 hour drive took all my energy, so I slept the day away. Mr. M cooked the girls breakfast, watched some tv, then went back to sleep. This trip I didn't have plans for things to do, just walk on the beach, and girls playing in the indoor pool. We would just find things to do while there. The girls woke me up from my slumber; I looked at the time, wow it was already in the evening! They wanted to check out the amenities, walk along the beach, and go to the indoor pool. I got up, got dressed, and the girls and I went out and walked the property. We checked out the beach, but it was way too cold to stay there, so the girls and I went to the indoor pool while Mr. M was still sleeping back at the condo. We were at the pool for a couple of hours, then headed back to the condo to wake up Mr. M so we could all find something to eat. As I mentioned before, many places are closed for the season, plus restaurants close early too. I was hoping not to visit any chain restaurants during our vacation but with restaurants closed at 9 pm and it was passed that during our search, we opted to eat at Outback Steakhouse and then call it a night. It's 9 am; the condo phone is ringing. Who the heck is calling us? I let it ring and went back to sleep. 10:30 am, the phone is ringing again. It must be important if whoever that was is calling back, so I answered it. "Hello, who is this?" On the line was a lady welcoming us to Wyndham, asking how are stay has been so far. I told her everything has been great, and then she proceeded to offer us a free lunch at member services, along with viewing a video of other Wyndham properties. I knew what this would turn into; she wants to offer us a timeshare. I hate those pesky salespeople trying to get you into timeshare meetings and lure you in by offering a five-day stay at a Wyndham property or a cruise, but the catch is that they'll pressure you to buy their timeshare. I asked her, "Was this going to be a timeshare meeting?" She assured me it wouldn't be, just lunch and watching a video of some of their newest properties. Umm...okay, free food and watching a video, I can do that, count me in. That chick lied!!!! It was a timeshare meeting! My family and I went to member services, and salesman handed us a box lunch, sandwiches, chips and drink, and said this meeting will be 60 minutes to 2 hours long. We do not have time for that! We were under the impression that it would be lunch and a short video. So the salesman was like, "If you stay you'll get a gift of $125 American Express gift card." Umm...we're cool off that gift card; we're leaving. The salesman upped his deal to $150 gift card. Mr. M and I looked at each other like, "Should we do it?" But 2 hours is too long, we had things to do, so we told the salesman we'll come back on Monday morning as long as we still get the $150 gift card deal. He said he'll keep that deal for us. We chit-chatted with him for a little bit, talking about different places to visit in Myrtle Beach, our recent trip there, and how I'm a travel blogger. We said our goodbyes to the salesman, he still tried to give us our box lunch, but we kindly passed on it and left. 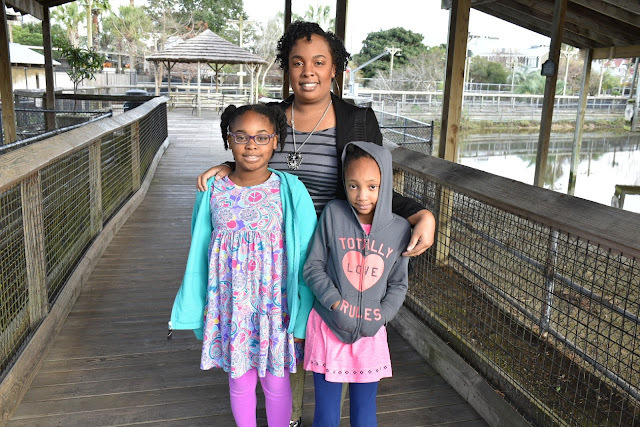 During our last trip to Myrtle Beach, I wanted to visit Alligator Adventure, an animal park that has swamps of alligators, and other animal species, plus live shows, they're also known as the Reptile Capitol of the World, but we didn't have enough time to visit there. I'm glad they're open all season, and we got a chance to visit during this trip. There were a lot of different alligators and crocodiles from all over the world, turtles, ducks, lemurs, wolves, and many kinds of exotic reptiles and other safari animals. While at Alligator Adventure, I felt like I was walking in an African safari, jungle music playing through the speakers to enhance the experience. We got to watch a live alligator show that a handler scooped up a snapping alligator from a pool of water, taped its mouth shut with electrical tape, and allowed the audience to touch it. I was too scared to touch; however Lauren was the only brave one that felt the alligator. 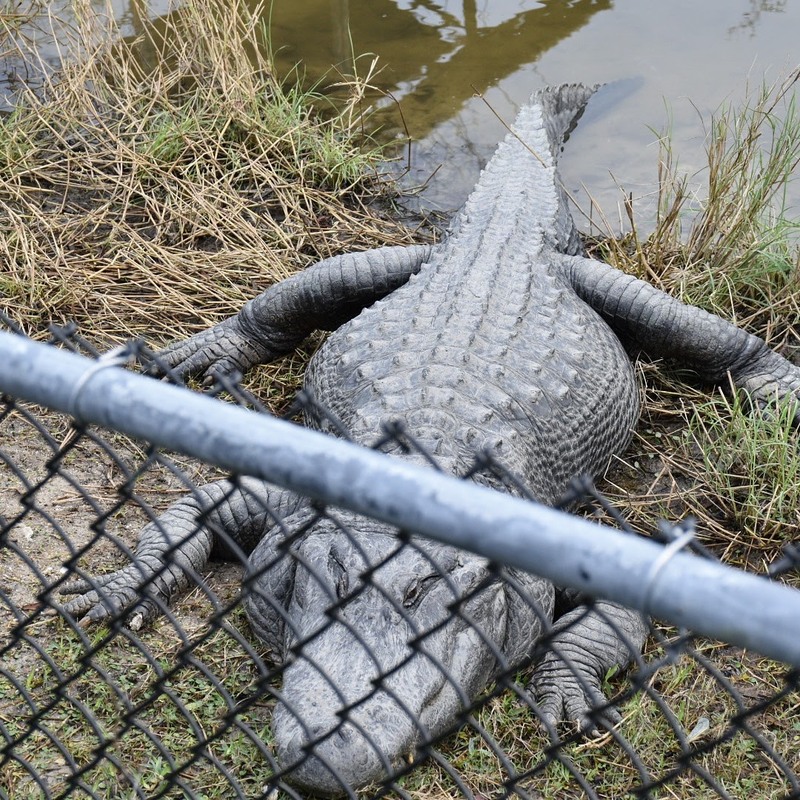 Alligator Adventure is a great place to visit, and educational too. Whenever I travel with the girls, I like to make sure we visit places they can learn something new. The girls have been learning a lot about different animals from all our various vacation trips. After our jungle adventure, we went on the hunt to find a place to eat. While Mr. M was driving, I looked up restaurants in the area on my phone. Nothing was catching my interest. We drove around for 30 to 45 minutes; then I made the suggestion to go to Market Common since that community has restaurants there, they also have my favorite restaurant Tupelo Honey Cafe. After dinner, I was on another hunt, but this time for Starbucks. It was in the 40s outside, and I was shivering like a leaf, I needed a hot drink to warm me up. We went to a nearby mall; I got my chai tea latte, bought myself an infinity scarf to help me keep warm, and we returned to the condo. Wyndham has their own DVD rental service, similar to Redbox (Wyndham's rentals are free), and the girls rented The Minion Movie and made it into a movie night while I worked on my laptop and Mr. M went to bed. Even on vacation, I still work on my blog. Since I worked on my blog until 3 am, I slept through the morning. It feels so good to be able to sleep in when I want to now. We didn't start our day until late afternoon. We drove around looking for places to eat and do a bit of sightseeing. I noticed Myrtle Beach was looking like a ghost town due to vacationers returning home since the next day is the starting of the work week. 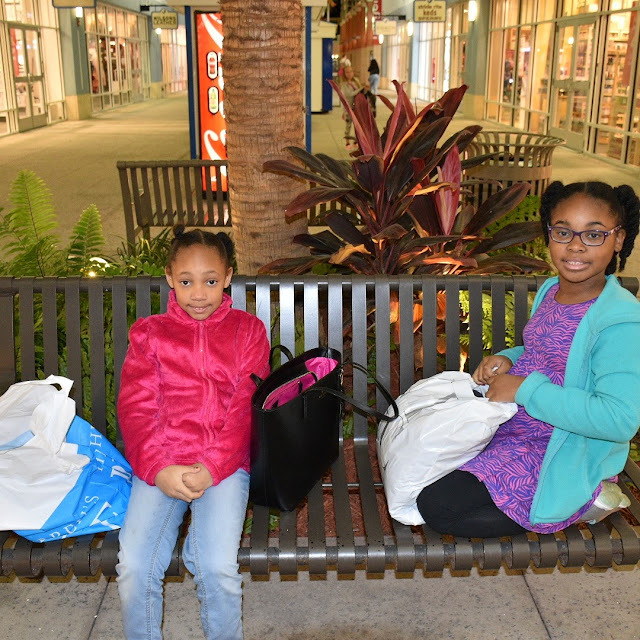 Sunday wasn't a very eventful day, just going out to eat at Flying Fish Market & Grill and do a little shopping at the Tanger Outlets. Flying Fish Market & Grill has fresh fish and a variety of different plates of seafood. I will say that the prices are kind of on the higher side, could be because they cook fresh seafood, but I think this restaurant is worth it. I would go there again. I love how the restaurant is right next to a waterway with boats docked on the water. Beautiful scene, especially when the sun is going down. Remember how I told y'all I have been so overwhelmed lately with a lot on my mind? Well, I didn't pack well for this trip, I missed a day of outfits for myself and the girls. I even forgot deodorant and my hair pick. I should have never packed the day of my trip. Word of advice, pack your suitcase several days in advance. Have a list of items you need on your vacation and check off what you have packed in your bag. By having a checklist, it avoids having to go to the store during your travels purchasing stuff you left at home. Also, check the weather of the place you're traveling to so you can dress properly. Some of the outfits I packed for the girls and me had us freezing. That's why we also had to go to Tanger Outlets to get warmer clothes. Remember about the timeshare meeting we were supposed to attend at 8:30 in the morning? I changed my mind about going. I was fighting off an head cold, didn't want to wake up early, plus those sales people were blowing up my condo's phone before the meeting even started! Just by them doing that I knew that they'll be pressuring us to buy if they're calling us over and over. Mr. M got mad getting woken up from his sleep, he got up out of bed and unplugged the phone. Also, I did research about timeshares, and it's not as good as it use to be. Non-timeshare owners can get the same deals at all-inclusive resorts like timeshare owners. And another thing, just like how I rented a timeshare without being an owner, I can easily do it again by finding them on third party websites like Priceline; this saves me thousands of dollars. Again, I slept the day away. We didn't have any plans to do anything for the day. Before we headed out for the day, we went to the pool area to take a look at the beach. The weather was freezing, making me feel like my nose and fingers were developing frost bites. But checking out the gorgeous views was all worth shivering in the cold. Remember how I said I love Tupelo Honey Cafe? We went back again! This time, I had their breakfast bowl and that was so good! Eggs, cheese, beans, Pico de gallo, veggie sausage, with sour cream on the side, delicious! I'd have that breakfast bowl again and again! Mr. M and Lauren were a bit disappointed with their meals; also, they didn't like the fact that the menu has changed, but they said they'll go again as well. After our lunch, we had nothing to do. We didn't want to go to the same places we visited last time, it was too cold to go walking around, and a lot of attractions were closed. We decided just to return to our condo so the girls can go swimming in the indoor pool. Earlier evening, Wyndham had a smores party by the pool near the fire pit. Once again I felt like I was frozen, felt like an arctic blast was blowing in the air. The girls had a blast roasting marshmallows and creating tasty smores, even though they had me sticking their marshmallows in the pit most of the times because the flames were blowing wildly. We ended our trip returning to Murrells Inlet to eat at the Dead Dog Saloon. I know what you're thinking, what kind of name is that? Walking into the establishment, there are real photographs of dogs on the wall that have passed away, but rest assure they do not serve dogs, that would be gross! Located on a waterfront, Dead Dog Saloon serves up seafood/American dishes. Great laid back atmosphere, with remarkable views of the docks and boats. They offer live entertainment for the whole family to enjoy. Since we were going to be driving home after our lunch, I wanted a meal that would be light on my stomach. I order a steak and shrimp taco meal that was seasoned to perfection! The taste reminded me of blackened seasoning that is my favorite on shrimp, chicken, and steaks. They say how you start the year is the way your year will be. I want to continue traveling with my family and creating memories together. I want to explore, see new things, and introduce my daughters to the world of travel. I feel everyone needs to take a vacation to unwind and leave all their troubles behind. Hey, I rhymed! 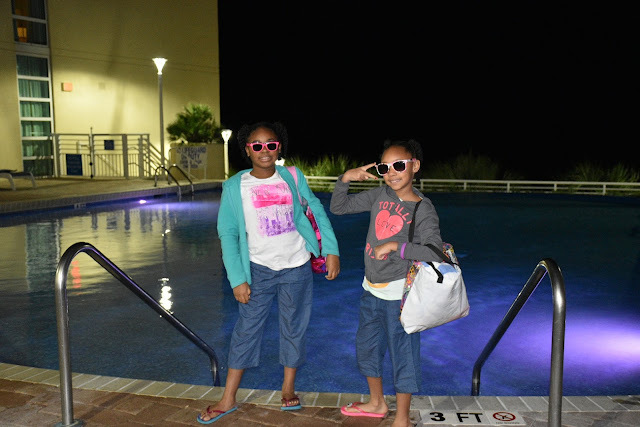 Myrtle Beach was a trip of relaxation, family bonding, and celebrating. Even though there wasn't much to do, my family and I had a chance to spend quality time together, and I'll always cherish these moments. 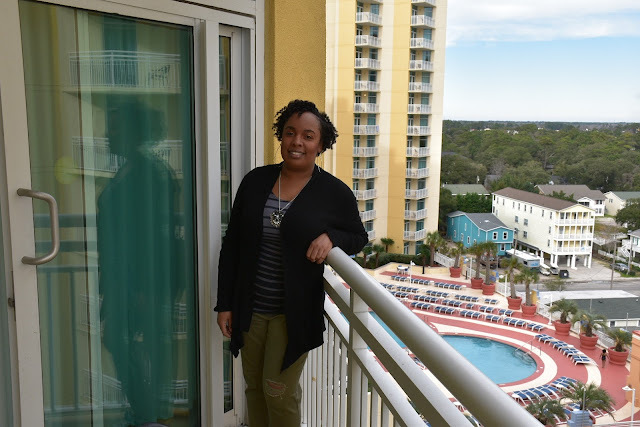 If you're looking for a relaxation trip, Myrtle Beach would be the perfect place during the winter months, also, they have great prices on resorts because it's their slow season. What are your thoughts about timeshare? Do you think it's worth to become a timeshare owner? I love Myrtle Beach! 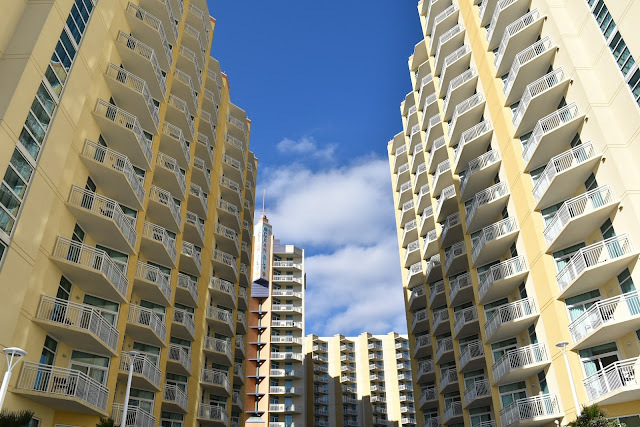 I think depending on the timeshare company and how many people you have on your timeshare, it could be a valuable investment. Also, Alligator Adventures has added some new animals since that last time I visited. I might have to check them out again the next time I'm back home. That's what I was thinking when it comes to timeshares. But for me it's much more affordable to find timeshares to rent on 3rd party websites. I never knew Alligator Adventures added new animals. I was expecting to only see alligators, crocodiles, and reptiles. I had always wanted to visit Myrtle Beach and had plans on trading our Orlando timeshare but now it's the Dominican Republic and Puerto Rico. Sis you should go. Much closer and cheaper than Orlando. Hi Lou...regarding Timeshares, I'm not an owner but my brother has been a Hilton Grand vacation club owner for many years. I think the investment is good for tax write offs, plus great if you take alot of family vacations. His family seems to enjoy it and I've gone to several of their properties and they're all nice. I could never fit ownership into my budget. So, I basically enjoy his ownwership privileges. Hilton Grand Vacation Club is at Myrtle Beach too, and they were also advertising rooms on Priceline. I didn't get it because they only had 1 bedrooms left. See, this is what I'm talking about, why get a timeshare if you can rent one without being a timeshare owner. I've read that timeshare owners are getting upset by this how non-owners are staying on the properties. My family and I LOVE Myrtle Beach! What I like the most, and it appears that you did this too, was relaxing and taking time to sleep. We also always take a trip to one of the buffets out there too. My daughter's favorite part is the water and boogey (sp?) board, so we normally go during the warmer weather. But it looks like you guys had a great time! Thanks for sharing your time off! And kudos to you and your journey as an entrepreneur [tipping my hat]!!! I never been to Myrtle Beach during the summer months, I bet it's filled with fun stuff to do. Right now, Myrtle Beach is doing a lot of repairs to get ready for summer season. My mom has a timeshare and since she moved to Florida she's been renting it out which pays for her annual maintenance fee which is great! We may trade out a week to visit a different location this summer. Def want to get back and visit Myrtle Beach since I haven't been there in years! Now that's a great investment. Maybe that is why I'm seeing timeshares on Priceline, owners are renting them out. Very smart! Yes girl, you need to go back to Myrtle Beach! 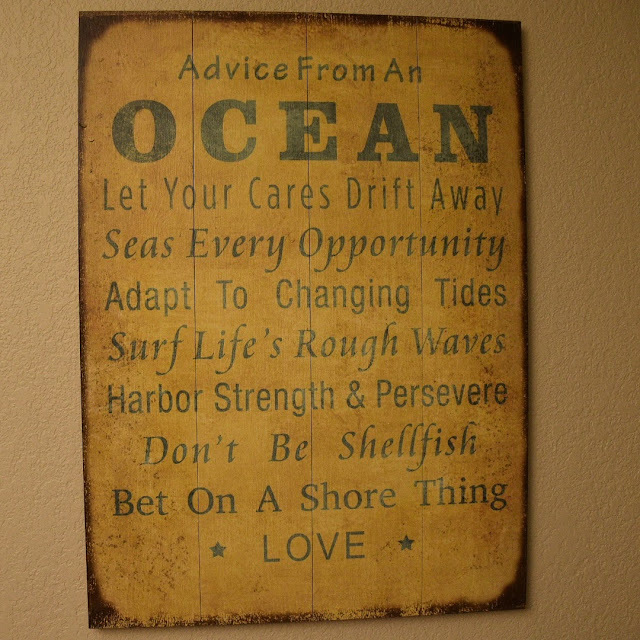 I like Myrtle Beach but being from SC we visited so often I needed a rest from it for a while. Glad you all had a blast though I would have cussed them timeshare people out big time. Girl, I would have folks crying if they really felt my wrath! What a fun way to bring in the new year. Everything is so beautiful! I still haven't been to FL yet, but I really need to put in on my "must do" list. I didn't go to Florida Stacie, Myrtle Beach is in South Carolina. Awesome trip of relaxing. Sorry it was so cold on yall. 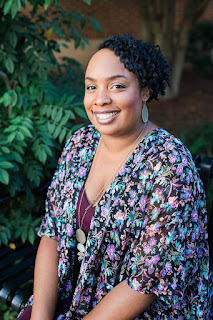 I want to start doing travel blogging! You can Suzie! Start off by blogging about your personal travels. Then start reaching out to travel brands. Need help, contact me. Brrr.... That looks like a cold time, but it still seemed like quality time with the family in a really nice condo! It looks like you had a fantastic trip, other than the timeshare soliciting. That would bug me. I hardly have enough time to take a single quality vacation a year, much less invest in a time share that I'll never get to use. We love beaches! I'll definitely consider Myrtle Beach for our 2016 vacay. I had no idea all of that goodness was right in our back yard, especially Reptile Adventures. That looks like so much fun! I saw Tupelo Honey when we visited Chattanooga last, but we didn't eat there. It looks delicious and they're coming to Atlanta THIS SUMMER! I can't wait to try their kibbles. WHAT!!!! Tupelo Honey coming to Atlanta!!!! I'm thrilled it's coming here!!! !